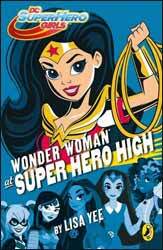 Wonder Woman at Superhero High (2017. 237 pages) is a novel, part of the DC Superhero Girls franchise, aimed at a young teen audience and I would say predominantly at a female readership. The novel is written by Lisa Yee who won the Sid Fleischman Humour Award for her debut novel, Millicent Min, Girl Genius. Now I know it’s been a long while since I had to suffer the indignity of either attending school or being a teenager, but the tone and storyline of the book seems to reflect the tropes of television shows rather than the real world. I’m guessing, from the picture on the cover that the characters are supposed to be in their early teens with the sort of aspirational bodies which would create another generation of anorexia nervosa suffers. If the girl’s figures are highly stylised then so was Wonder Woman’s experiences at school, it’s like Yee took a list of things which needed to be included - cute boys, jealous and mean girls, achieving fulfillment as a person - and crammed the lot into a single book. Not all of this is the fault of Yee, as the majority of the book follows the storyline of the show's first 2015 season, so the tone of the voices and much of the content have already been decided by someone else and what may work well on a cartoon show may sound a little too young when you’re playing the action in your own head. It’s a bit of light fluff, enjoyable for all the nods to the wider DC universe, but I think most readers will feel that the characters have been written younger than they actually are.